Welcome to Vista Ridge! A secluded cozy and upscale one bedroom cabin near Unicoi State Park and Helen,GA. Vista Ridge is a perfect cabin for getting away and relaxing with that special someone. 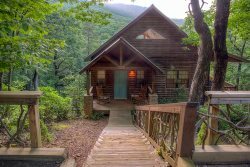 This elegantly rustic mountain cabin, just 6 miles from Helen, offers the ultimate getaway for a few days of quality alone time. You may never want to leave! 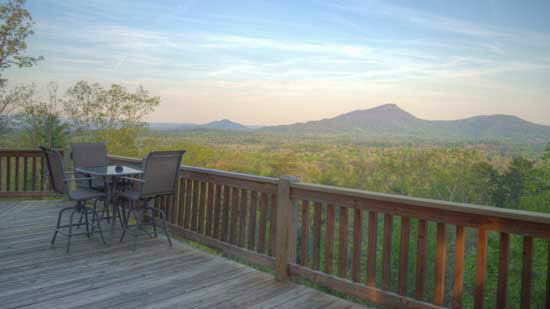 Vista Ridge features a wall of windows showcasing the amazing views of Tray and Chimney mountains. A swivel flat screen TV, pool table, and a double-sided, floor-to-ceiling gas fireplace provides a perfect night inside this wonderful couples cabin. The open layout of Vista Ridge is laid back and relaxing. Move effortlessly from the living room to the bedroom, and watch TV from bed! The pool table and corn hole toss game are great for some friendly competition, or just unwind in the hot tub nestled inside the screened back porch. Once the stars come out take a moment and enjoy the quiet and brilliant night skies, far away from city lights and sounds! The mesmerizing flames and gentle crackling of perfectly seasoned firewood in the outdoor fire pit provides a natural relaxer to balance the stress and activities of everyday life -- you may even want to stay a few more nights! My wife and I thoroughly enjoyed our week. It was very relaxing and felt like a home away from home. We had a great time. Did not want to leave. This cabin was wonderful! Very clean, updated, and a beautiful view! We loved everything about this place and are already planning another trip! Highly recommend! Brought my wife up for a birthday weekend celebration. The cabin was amazing the bed was very comfortable and it was the perfect cabin for a couple looking to get away for a few days. We really enjoyed the layout of the cabin both inside and out the hot tub and just being able to have a secluded area with a nice view to enjoy time together. Very easy and understanding to work with! Rarely do you ever eat the true sight of a property through pictures online. But with Vista Ridge we walked in and were amazed to find it looking and feeling way better than the pictures led on to be. It was quite nice since our previous cabins through other companies hid stuff through their pictures online. Best cabin we have ever stayed at. Thank you for an amazing trip. Loved Pinnacle and Vista Ridge, we will be back! We have booked with Pinnacle for about 5 years now and we never have a problem with the staff. They are always very nice and very helpful. Ashley was the one that helped me as we were looking and was great. We loved the Vista Ridge and if all possible we will book it again next year. That is now our new favorite cabin!!!! My husband and I had an amazing beautiful time here for our honeymoon. We will be back as Vista ridge is extremely clean and has all the basic utensils for cooking. Absolutely LOVE this cabin! Very nice and clean property! Great view of the mountain!! Everyone at Pinnacle Cabin Rental is super friendly and helpful! We've rented from them at least a dozen times. We've only very rarely had an issue, and it was always resolved courteously and timely. Everyone that I spoke with on different occasions was very friendly and very helpful. I did call a few days before our arrival because I had not received the email with directions and the lady I spoke with took care of it immediately. I called again on Saturday to make sure we were to leave trash inside since there were no outside bins. Everyone was great. It was a very relaxing few days. We enjoyed sitting out on the deck and the screened in porch. We enjoyed the hot tub. We enjoyed playing pool. Very quite and peaceful location.